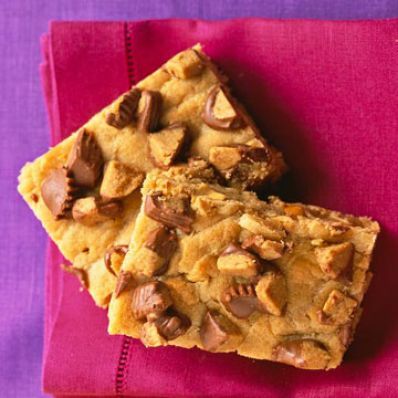 To make these easy bar cookies, stir peanut butter and peanuts into a cake mix batter and top the bars with chopped peanut butter cups. 1 of 3 Heat oven to 350 degrees F. Coat 13 x 9 x 2-inch baking pan with nonstick cooking spray. 2 of 3 Place cake mix, butter, egg, peanut butter and buttermilk in large bowl. On low, beat 1 minute, until combined. Beat on medium 2 minutes. Add peanuts. On low, beat just until combined. Spread evenly in pan. 3 of 3 Bake in 350 degree F oven 25 minutes. Sprinkle peanut butter cups over top. Bake 10 minutes, until candies begin to melt. Let cool in pan on a wire rack. Cut into 20 blondies. Makes 20 blondies.